Yesterday's entry, Ikaruga, is a relatively recent, more artistic classic. Today's entry is simple only in its age, but carries a complexity and excellence that still stands out today, 28 years later. Unlike Ikaruga's relative rarity, it's a game that everyone's played. It's a him...well, you know who. Some of the games in the Agency Group took a lot of internal debate and thought before making the list, and I'm still bouncing a few titles around in my head. Meanwhile, some were blatantly obvious. This Group's main inspiration, the Criterion Collection, hasn't actually released a new-format version of Citizen Kane - generally considered, in most critic circles, to be the greatest film of all time - since the original laserdisc release back in 1984. The Agency Group should have no such oversight. There really isn't much I can say about Shigeru Miyamoto's Super Mario Bros. that you probably don't already know. This is, again, a very obvious selection, but that obviousness is for a very good reason. I'll address a few key points to go into a bit more detail about why Mario deserves such an honor, just in case you're somehow not already convinced. These points may seem full of hyperbole, but the amazing thing is that they're all true. Super Mario Bros. is a game built around a core mechanic that still resonates almost thirty years later. No single game mechanic has impacted gaming more than Mario's jump. In most previous games, enemies were dispatched with a weapon: a sword, a laser, your fists. Mario can't touch these enemies from the side, or he'll die. Instead, he lofts himself above them, bounces on their heads, and carries onward. In a wide variety of games since, whether or not the main character has really needed it, they've been able to jump, though few have ever replicated the simple action as well as Super Mario Bros. It has served as the foundation of the platforming genre and spread to just about everywhere else. Its memorable score, taut construction, solid level design, distinct enemies and useful power ups have influenced nearly every game developer on the planet. Other games had music. Koji Kondo's Super Mario Bros. Theme is one of the most well-known pieces of music worldwide this side of The Beatles. Other games had levels. Mario encouraged variety and exploration, discovery and secrets, teaching you how to play in the beginning and growing from decent challenges to strikingly hard tests. Other games had mooks. Mario had lizards, turtles and...whatever Goombas are. It's relatively absurd art style stood in stark contrast to many of its contemporaries and still stands out. Other games had boosters. Mario ate "magic mushrooms" (while the game came out in the 80s, this would've fit right into the arcadey 70s) and fire flowers that toe the line between useful items and gamebreaking cheats perfectly. It's a game that Nintendo has polished time and again, with much success, on almost all of their core consoles and portable systems. I might be slightly off here, but I think Nintendo has released approximately 193 Mario games, sequels and ports...again, that's a rough estimation. All of their main consoles have seen a version of this 2D benchmark and he shows no sign of slowing down, even on a plumber's salary. Its star is quite possibly the most recognizable fictional character, of any medium, in the world. Sure, Mickey Mouse, Sherlock Holmes and James Bond might all have a bone to pick with that statement. But Mario might just have them all beat, and does so with a smile, an accent so lovingly over the top Nintendo's even managed to avoid controversy in an increasingly kneejerk society, and consistently excellent games. Its sales helped to, in no uncertain terms, keep the entire industry afloat after a devastating crash. The infamous E.T. had essentially kneecapped Atari's development arm and allowed for power in the industry to shift to Japan. However, that shift passed by without a true hit until 1985, when Mario hit the scene. Its 40 million in sales (still one of the highest selling games of all time) shocked gaming back to life and put Nintendo at the forefront of the industry, a spot they would hold onto for over another decade. I considered a whopping five other Mario titles for this spot (3, World, RPG, 64 and Galaxy) but, ultimately, had to settle on the OG. The Godfather. 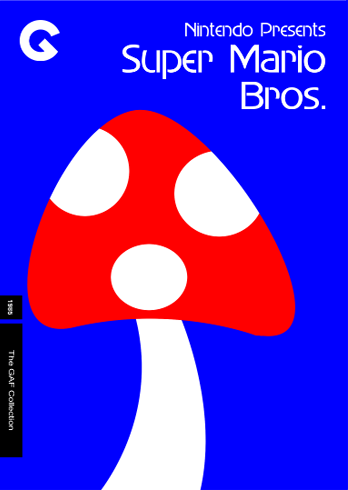 Super Mario Bros. It is, quite simply, the most important video game of all time. You can buy Super Mario Bros for nearly every Nintendo console ever released. I'm not kidding. Next up: The future is really, really fast.